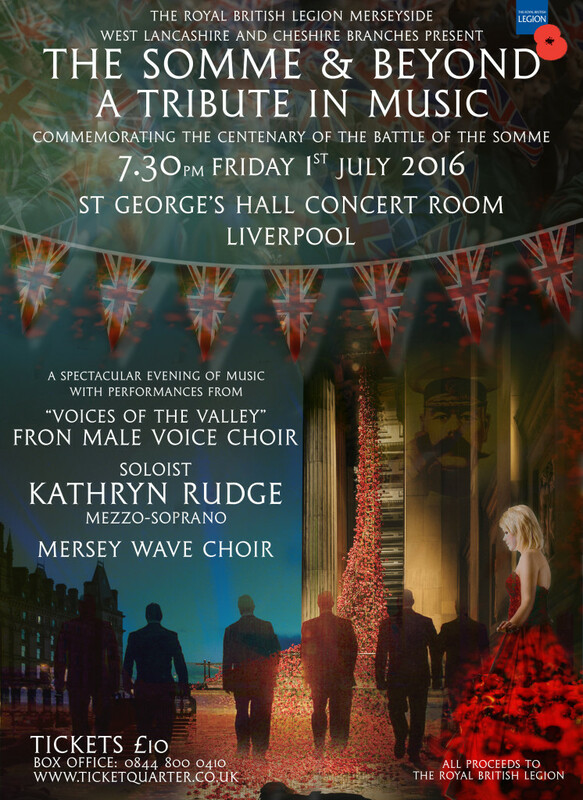 Friday 1st July 2016 marks 100 years since the Battle of the Somme.” A unique concert is being held in the City of Liverpool to pay special tribute to all those who fought and tragically lost their lives during the Battle of the Somme and WW1. The concert takes place in the beautiful Concert Hall at St George’s Hall, Liverpool. With performances from the “Voices of the Valley” Fron Male Voice Choir and special guest soloist mezzo-soprano Kathryn Rudge (BBC Radio 3 New Generation Artist). The evening will also include performances from our local Mersey Wave Choir. A tribute in music across 100 years from the battlefields and back home to Liverpool. The “Somme and Beyond” programme will include songs from wartime, opera and musical theatre, poignant readings and a rousing “Last Night of the Proms” finale. An evening not be missed for all the family with all proceeds for the Royal British Legion.